Sumatra, being the biggest Island of Indonesia, hosts the largest and the most beautiful rainforests you can find in Southeast Asia region. 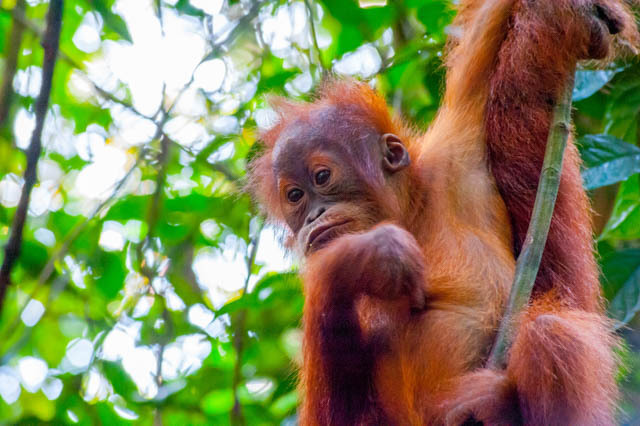 Those rainforests exist in national parks of Gunung Leuser on the Northern and Bukit Barisan Selatan on the Southern regions of the island, and host so many different species which can only be found here, like Sumatran Orangutans. 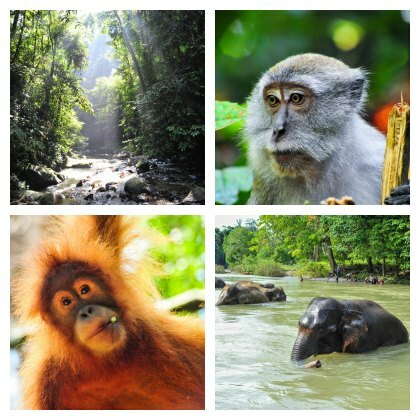 In this blog I will tell you about the part of the rainforests in the Northern part of the Island, in Gunung Leuser National Park, which I visited in May 2015. My journey to Sumatra started with a short delay of one and half day, because the plane from Malaysia to Medan airport decided not to take off in the last minute. After our arrival at Medan airport, our guide Ihsan welcomed us and we started driving to our accomodation in Tangkahan, in a Saturday traffic with thousands of couples with scooters driving from Medan to nature sites nearby for a weekend picnic. On our way, we learned that with that amount of traffic it is impossible to arrive at our destination in daytime, which was going to make it difficult to walk into our camp at night, and we needed to eat on the road. So, I made my start into delicious Indonesian cuisine with deep fried pastry bought from the carts I saw on the roadside. 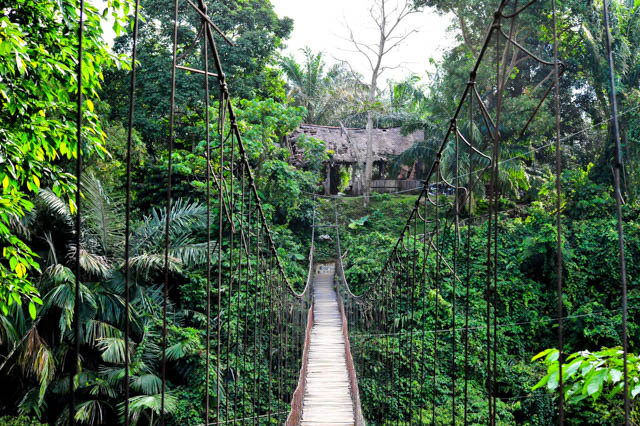 When we had arrived, we had to walk our way towards the camping through the rainforest and through a long wooden bridge on the river in complete darkness. Immediately after we had arrived at our nice wooden hut next to a riverbed, it started to rain like hell. Pouring water by bucket was not strong enough to describe it, but it rained so hard that it was impossible to hear someone next to you from the loudness of the falling rain. I slept half awake since I had never seen such a terrific amount of rain in my life and wanted to check the river flowing next to us for flood. The next morning, rain had stopped and we saw our camping area and the river by daylight. 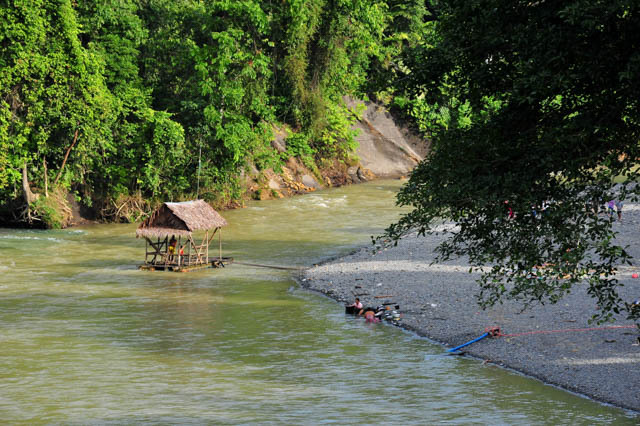 The camping place (or visitor centre) was rather new located next to a riverbed in Tangkahan, consisted of different small individual campings and guest houses. Local boys who hire the huts were quite proud of their new visitor centre telling that in 5 years it will explode with tourism and very proud of their new wooden bridge. Just one year before there was no bridge and they had to pass the river with wooden boats (and not at night). I asked them about the rain last night, telling how immense was it and if we had any danger of flood; but they could not understand why I got surprised with it at all..
We started walking on the riverbank to explore the beautiful nature around. It was weekend, so everywhere you could see families from around the area came to river to have a picnic. We got stopped by many of those, mostly youngsters to get a selfie together; and in return I got their food. I ate the best lunch I can ever have there, barbecued Indonesian home food from the picnickers. 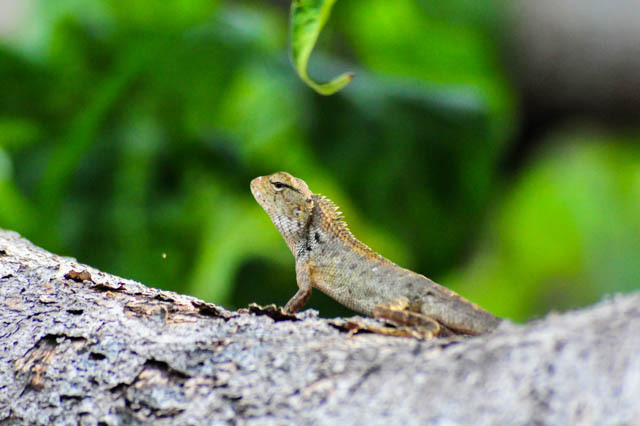 The nature around was amazing and there were many wildlife starting from different kind of monkeys and flying lizards jumping from tree to tree, to huge colorful butterflies flying around. 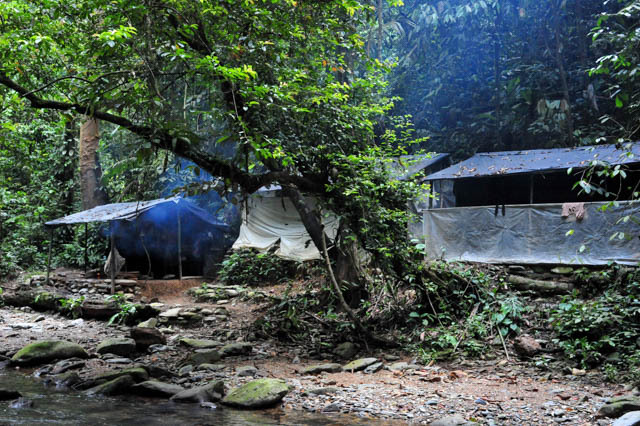 After walking a while, we reached a camp which they keep protected Sumatran Elephants. 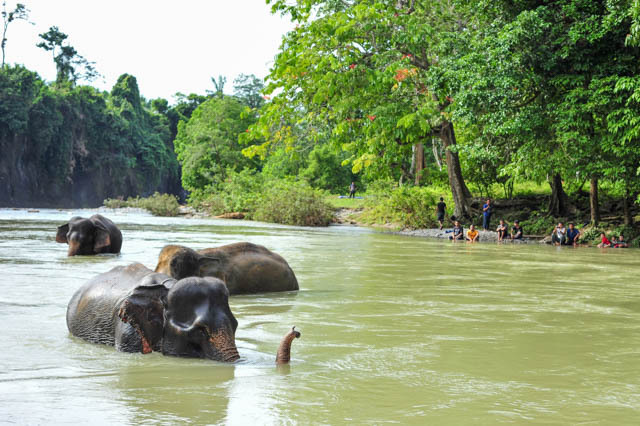 At the time, the elephants were having a bath in the river. One of the keepers invited us to wash them with a brush, which we did not refuse. We washed the elephants softly and in return they washed us. The elephants here are protected species which are smaller than regular elephants and only found in that region. Although they are protected species, the keepers and camping site owners offered us a ride on them. 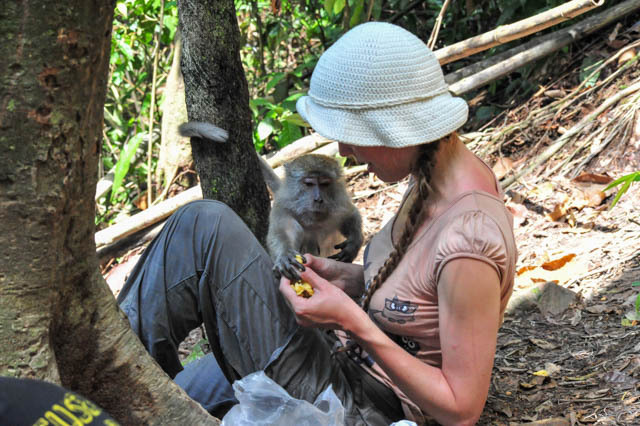 Keepers say they do not hurt the animals to train them but you can never know..
To explore deeper into the rainforest in Tangkahan, you can find a trekking path where camping area ends, which is used by guides there and allows you enter directly into the rainforest. We took this entrance and walked into the forest for a while without any guide, and without any difficulties and returned before it gets dark. The next day, after all the weekend visitors had gone, we decided to swim in the river and they offered us a trip with what they call as 'tubings', the inner tires of trucks. Although I find that a bit childish, I decided to give it a try and we cruised in the river with inner tires watching the view of the riverbanks, in the end reaching a beautiful waterfall where two rivers cross each other. We spent the rest of the day here and enjoyed a good waterfall massage under the stream. To sum it up, Tangkahan is a beautiful camping place which was rather newly built when I visited there, and we had spent a good time here. 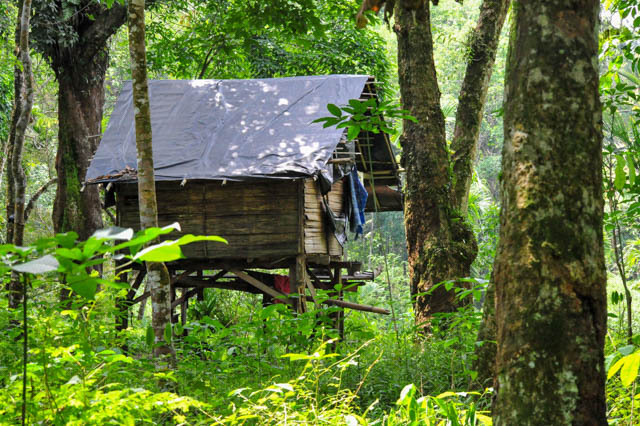 We booked our stay in advance, and name of the hut we rented was 'Jungle lodge' as far as I remember; was a nice little hut looking directly to riverbed, which also local people swim, wash their clothes and do picnics. On that time of the year, it was not crowded with tourists and we hardly saw two three other tourists in the area. For the facilities, the camping area has a small market and a restaurant hut in it. As you might expect, these facilities in the camping are touristic, and expensive compared to Sumatran standards (And the market never returned our remaining money after our shoppings :). We travelled to our next destination, Bukit Lawang from the forest road (said to be forest road) between Tangkahan and Bukit Lawang. Here on the road we had experienced the terrific environmental issue Sumatran Rainforests face: palm oil industry. All the way from Tangkahan to Bukit Lawang, which supposed to be the parts of same national park and rainforests, was full off palm tree plantations, for kilometers and kilometers... I would like to write a couple of words on that later. We had arrived Bukit Lawang after a half day of trip and settled in our hostel. Bukit Lawang itself is a bit bigger town next to a riverbed than Tangkahan and on the other side of the river, there are a number of guesthouses and hotels. The accomodation is plenty and various from luxurious rooms to very cheap wooden hostels. There were quite a number of hippies I met around which came here in the past and settled here opening hostels or restaurants. The town itself did not have much to see in it, one or two warungs (restaurants), which I used for eating instead of touristic food, and one or two shops maximum. In fact, except weddings (which I witnessed one) there was not much people to see around the town. At night the main street was quite empty and shops and central restaurants were closed except the ones that tourists were eating. 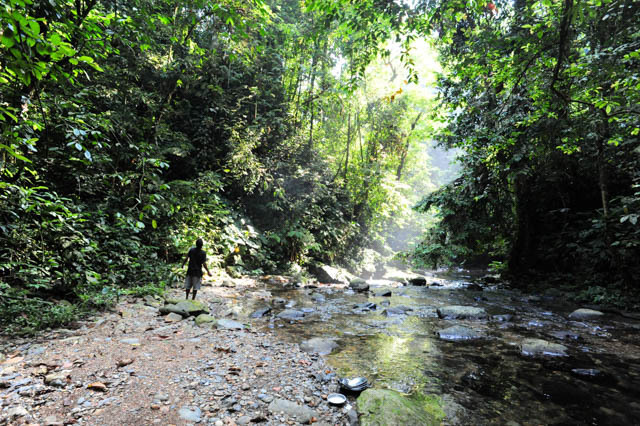 Unlike Tangkahan, walking into the forest directly from your camp and exploring it by yourself was not very possible. Only, there was a path going to what they call "Bat cave" next to the hostels. We walked that path for very long seeing nothing interesting on the way, only more campings and a cave filled with trash. The trips into the forest here are done by local guides who know the forest well. We booked our trip into the forest with forest stay, praying it will not rain in our visit like our first day. I highly recommend you stay in the forest with your visit because tours without stay are shorter and you do not see the beautiful riverbed. We started our walk into the forest early in the morning and just after a couple of hours we met our first Orangutan family. These lovely creatures just come next to you and hang out, time to time getting very close and picking the bananas you hold. They come so close to explore what you have that you can even touch them. 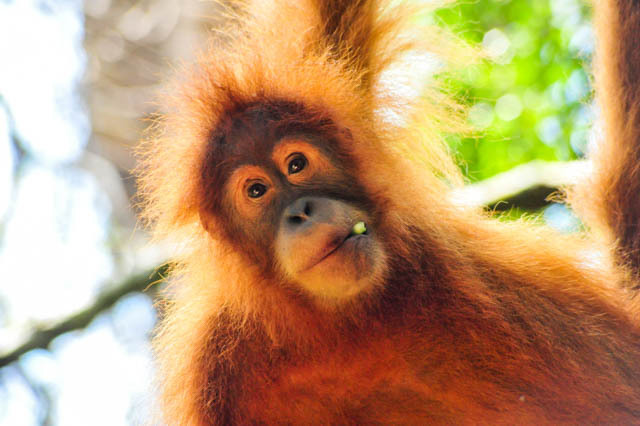 Tourists and guides used to feed them when they visit, so it is not a big deal to find orangutans in the forest here in Bukit Lawang since 'they' find you for food. We left the family because the mother orangutan got a bit nervous with the people around and guides said that it could be dangerous. 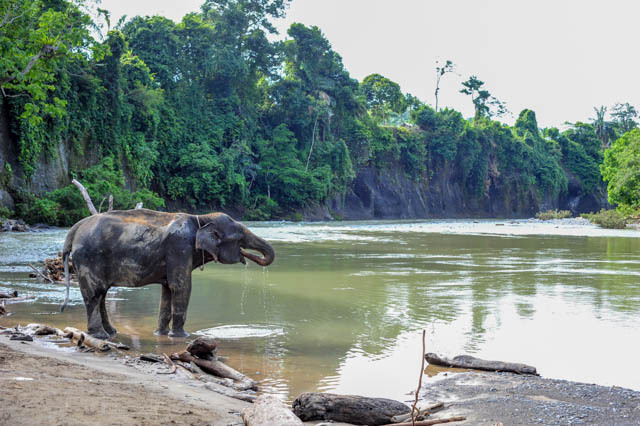 Although we have visited Sumatra before their tourist season started, they had wounded around 25 tourists in the area within 5 months as far as guides told us. 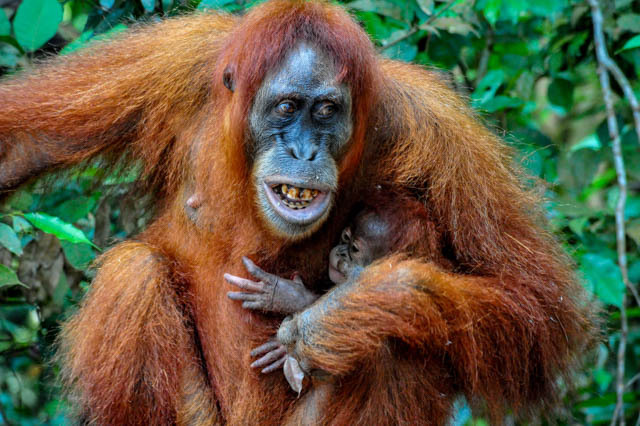 They told that the attacks are increased in the last years (orangutans selfies?). 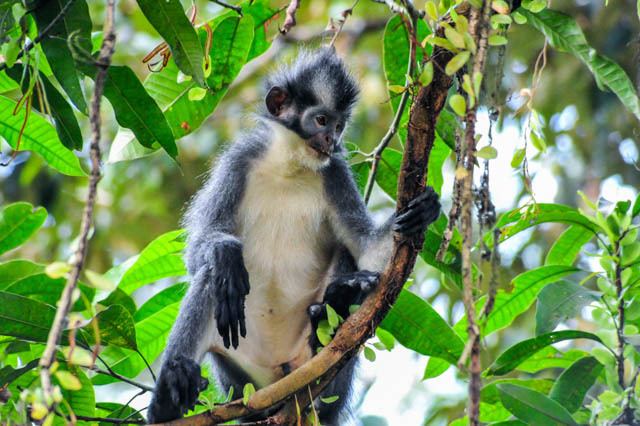 Orangutans are not the only animals you can see here, number of different monkey species, iguanas, giant ants, flying lizards and various huge and colorful butterflies are quite common to see. Seeing birds is a bit tricky since trees are extremely high and daytime they hang on the trees. So you hear their singing but cannot see anything. A huge group of monkeys started to follow us until we had arrived the viewpoint for eating our lunch, they knew we are going to eat something in the end. 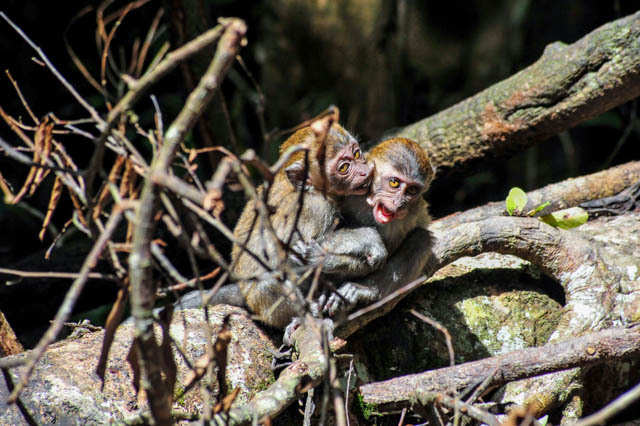 These maqaque monkeys, unlike same species in Bali or India, are not aggressive but rather calm and peaceful. The guides said that these peaceful species are specific to Sumatra only. They peacefully ate with us and played around while we watched the lovely rainforest scenery below. Walking a bit further we met another orangutan family and spent some more time with them. Then we started to descend for the riverbed which we were going to camp at night. Before we arrived the riverbed we met our third orangutan family and saw some wild bird species which I could not take photos because my camera had fallen walking downhill. Luckily I was able to mend it for the rest of my trip. Good mention that, if you plan to take photos here, bring a camera which is sturdy, weather and shockproof if possible (you get wet from thick moisture, even if it is not raining), and having a good low light performance because most of the rainforest do not receive a good amount of light. The riverbed we reached was the most beautiful part of our trip. 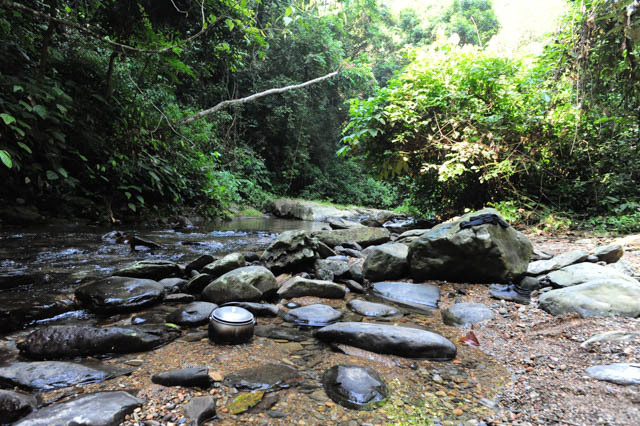 It was possible to explore around just walking on the stones, with kingfishers flying on top of the river and monkeys and other wild animals coming by for drinking water. The accommodation here is quite simple, no luxuries. A tent made from greenhouse plastic sheets with no toilet or anything similar around and a place which a local cook prepares catched fish from the river and other food for you on the fire. Make sure you bring something soft to sleep on because tent does not have any soft ground underneat. We were lucky that in our camping we were the only ones staying for the period. They told in those tents, they generally host 12 people together. I can imagine sleeping within 12 peole but toilet seems to be a bit problem at night (and daytime) next to that 12 people.. And it might be a good idea if you bring your own tent afterall. The food our local guy cooked in the forest was the best food I had ever eaten in all my trip to Sumatra. Sitting on the campfire, it is possible to spot some huge hunting reptiles around the camp if you are lucky with your torch. 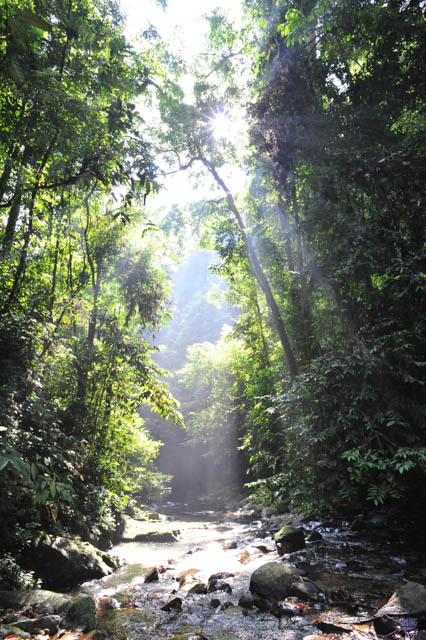 The sunrise in the forest is another beauty to mention, the forest slowly awakens while the sun is rising behind the trees and it blows everywhere with light after it reaches above the long rainforest trees. After our stay was finished in the forest, we returned to the town following the riverbed. Our cook in the forest returned together with us and invited us for a dinner with his family but we sadly refused it because we had to leave Bukit Lawang. Just after our return, it started to rain again and the other group came later than us, caught by the rain in the forest. They had arrived quite exhausted a couple of hours after our return. 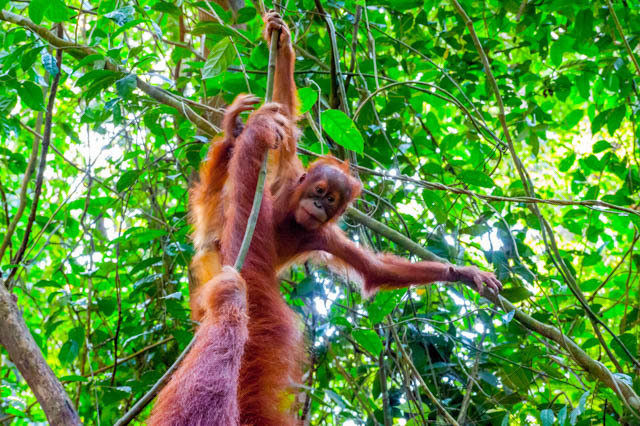 To conclude, Bukit Lawang is one of the most beautiful spots of this national park which I can guarantee you can meet at least one orangutan family if you do a tour into the forest by the guides. There is quite a variety of good accommodations and good restaurants with decent price around including the warungs in the town center if you like local food. It is a place which I recommend everyone to visit once a lifetime. Sumatra has an industry producing palm oil. Simply, palm oil is created from the palm tree fruits, which are grown in palm tree plantations across the country, then bought for quite cheap prices by big carters, and in the end sold to big companies to be used in their industrial product. Palm oil is used in many different industries, like producing cosmetics and as an ingredient inside nearly all fake food you can buy at supermarkets. To be able handle the huge demand for palm oil, many rainforests all over the world is being destroyed and palm plantations are built instead. 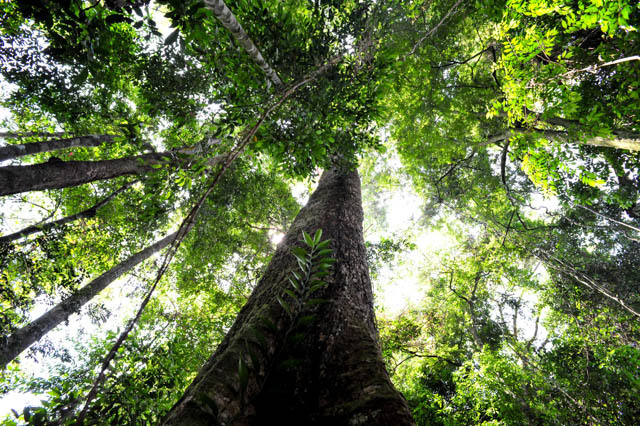 Palm oil industry does not only cause rainforests to disappear, planting the same tree in such large areas also contributes to global warming in great scales. All over the world, the plantations now expand immensely as demand by industry increases and palm plantation expansions are becoming one of the biggest environmental issues the world is facing today. For those reasons, boycott all palm oil products. Check for usage of palm oil in the products you use and do not buy them if they contain palm oil. You can use mobile apps like Buycott to check the products you use has palm oil in it. Hope before it is too late, this greed comes to a stop and those wonderful remaining heritages of nature are saved for us and our future.